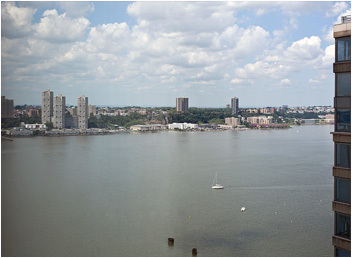 Glorious city and Hudson River views abound from every window in this mint 27th floor 2 bedroom,2.5 bath home. The apartment occupies the northeast corner of the building and has been meticulously renovated with an understated modernist sensibility. The renovation includes a frosted glass pocket door which encloses the kitchen, custom cabinetry hiding the heating/cooling units, beautiful lighting sconces, window treatments, and other custom built-ins including a superior sound system and bookcases in the second bedroom. There is a powder room for guests and each bedroom has an en-suite bath. 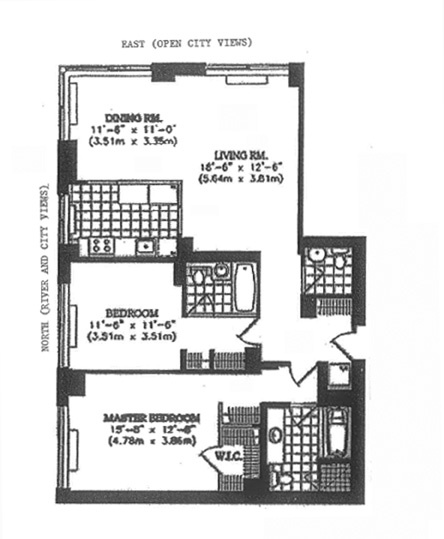 The apartment also includes a washer/dryer, marble baths and windowed kitchen. This apartment located on a floor with only 5 homes creates an air of intimacy. Amenities this condo building offers include a 24 hour doorman, concierge, health club, indoor pool, children's playroom and on-site parking garage.